If a delicate lone butterfly meandering from flower to flower in your backyard garden brings a smile to your face, then you do not want to miss your chance to witness hundreds of these lovely creatures in our Key West, Florida, Butterfly Conservatory. You will feel as though you have stepped into a strange new world full of wonder as you see fifty different butterfly species in our enclosed habitat. You will be charmed as you observe these delicate and colorful insects fulfill their role in the ecosystem by flying from bloom to bloom, pollinating plants. The astounding spectrum of colors and variety of patterns on the wings of these amazing creatures will surprise and delight you and your children. Kids will not only enjoy viewing the prismatic denizens of our enclosure, but also learning about the anatomy, migration patterns, life cycle, diet, and role in pollination from our expert naturalist guides. This tour is not merely for show; it is highly educational. 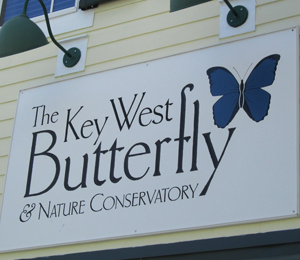 The Key West Butterfly Conservatory is dedicated to raising awareness about the importance of these small and lovely creatures to our ecosystem. Because of our commitment to wildlife preservation, none of our resident butterflies are wild caught; we receive all of our butterflies from farming operations which release any superfluous insects into the wild to play their vital role in plant reproduction. These creatures play a crucial role in the continuation of plant species in tropical regions. The flora that continues to thrive from the butterflys work can help to assist the flourishing of tropical plants that help to sustain any number of wild animal species like birds, insects, reptiles, amphibians, mammals, and birds. I have been to the Bahamas many times, but Butterfly Conservatory is one of my favorite trips! It includes everything that everyone should do here. As a Bahamas veteran, I can say only the best about this experience!